What do statistics on regions and cities tell me? Specific geographies such as coastal regions, mountain regions, border regions or island regions are also covered. 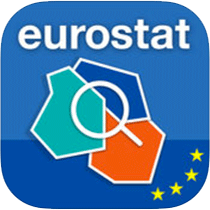 What tools does Eurostat provide to visualise these data? Enjoy the latest edition of our regional yearbook and get a taste of the wide range of EU statistics available at regional and local levels. Visualise the most recent statistical situation at different geographical levels by using maps, graphs and an animated timeline for various indicators. Try our statistical atlas based on tailor-made maps for statistical and geospatial analysis. It also gives you the opportunity to focus on single administrative units. Have fun with our mobile app 'My region' or with the tool 'My capital in a bubble' to compare your region or capital city with others in the EU. Read our publication which offers an analytical and descriptive view on urban and rural areas providing detailed information for a number of territorial typologies. This screen resolution is not supported by the desktop version of My Region. You can use the My Region mobile app instead, please click the icon on the left selecting your system (iOS/Android). Please select a region to see key statistics on regional indicators. For feedback, please contact ESTAT-REGIO@ec.europa.eu. What is the NUTS classification? Learn about the nomenclature of territorial units, subdividing the EU territory into regions at 3 different levels. Let the 'Geographic Information System of the Commission' (GISCO) help you to visualise and analyse geospatial information. Have a look at our website section on land use and land cover statistics (LUCAS). This publication provides a detailed view on the territorial typologies at grid, local and regional (NUTS) level.